QSC Audio increased throughput 70% with help from progressive assembly carousels, automatic data collection, and a smart workforce. Ever since it moved into a new manufacturing facility last October, QSC Audio Products hasn't missed a beat on its way to higher productivity. Manufacturing throughput of professional audio amplifiers increased 70% with only a 15% increase in floor space. The annual rate of production inventory turns more than tripled to 80 from 25. 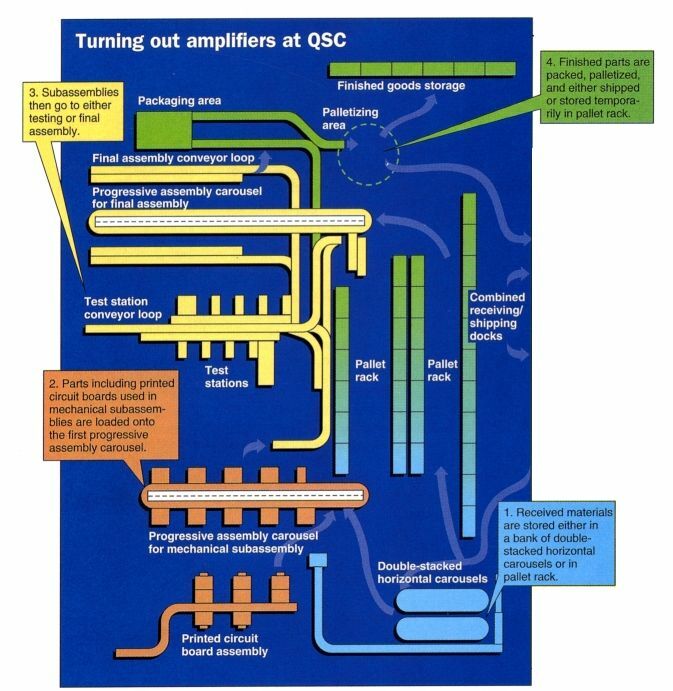 Today, the average component is assembled into a finished amplifier just 3.25 days after it arrives at QSC. This "sudden success" was 2 years in the planning, explains chief operating officer John Andrews. 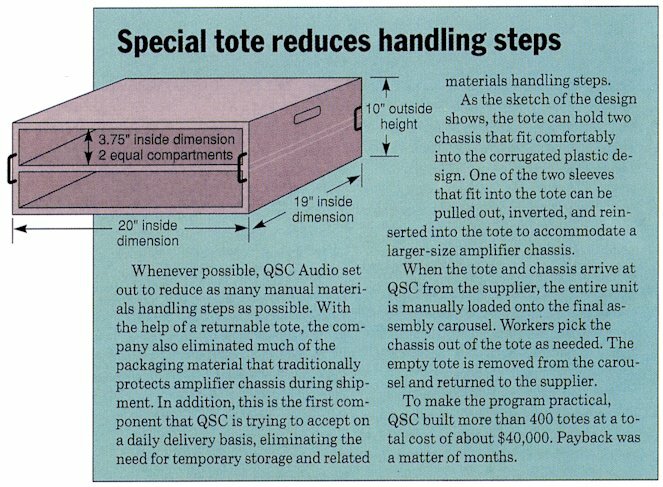 Since its founding in 1968, QSC Audio had operated from a small colony of buildings and Quonset huts in Costa Mesa, Calif. Manufacturing was a push system and work-in-process was moved by carts between buildings. As the company's compound annual growth rate hovered in the 20-25% range, a more efficient pull system under one roof with an emphasis on elimination of waste became essential to future success. Andrews and a team of key people agreed that any materials handling plan had to accommodate faster product cycle times while improving manufacturing and materials management. Two years before QSC moved into its new manufacturing facility, a project team was formed to develop project objectives and goals that fit a 5-year strategic plan. Aiding the process was Wyatt Hyora of CMP Group and a long-time materials handling consultant to QSC and FloStor Engineering which integrated the system. Following are the design goals that the team used to evaluate each potential materials handling solution. Support a lean business strategy with an emphasis on just-in-time, elimination of waste, and rapid manufacturing cycle times. Enhance manufacturing flexibility with variable workstation assignments and flexibility in work-in-process routings. Improve materials handling efficiency and throughput. The entire manufacturing floor today is only 21,000 sq ft. Two sets of double-stacked horizontal carousels manage incoming parts while two additional horizontal carousels (White Storage and Retrieval Systems) feed progressive assembly at 40 workstations. Conventional rack stores pallet loads of finished product. Beyond the materials handling systems, QSC installed an extensive information handling system that complements the materials requirements planning (MRP) system already in use. Bar codes, a radio frequency identification RFID) system, and data management software are central to information handling. Total cost of all materials handling and information handling systems was just over $900,000, says Andrews. That price tag did not just happen to come out low for an integrated system with such a high level of material's handling automation. "All the key decisions we leave up to the people on the floor. You would pay far too much to get equipment to do what people do best: thinking and making informed decisions," says Andrews. "Our practical objective is quite simple," explains Bob Meigs, director of manufacturing operations. "We want to be able to either have each model in stock or be able to manufacture it the same day an order comes in," he says. Parts that go into an amplifier range from printed circuit boards to screws and bolts. Larger parts such as power transformers and chassis are received either in cartons or special totes (see box) and temporarily stored in five-high pallet racks. Over 2,000 different smaller parts are stored in two sets of double-stacked horizontal carousels near receiving. Workers keyboard critical information at a terminal at the dock. A printer then generates a bar coded receipt form that travels with the parts by conveyor to the carousels. While most parts are stored at floor level, circuit boards and components that need to be prepped prior to assembly travel by vertical lift to a mezzanine for easy delivery to an adjacent mezzanine for prep. A stand-alone software package manages the carousels and the parts in them. To begin put away, a worker scans the bar code on the receipt form and follows instructions on a terminal to store the parts in an assigned location. Kits are picked daily based on information managed by the MRP system and downloaded to the carousel management system. Software coordinates carousel movements to streamline picking. Picked parts from the lower raw materials carousels are moved by hand cart just a few feet to the carousel that feeds subassembly workstations. 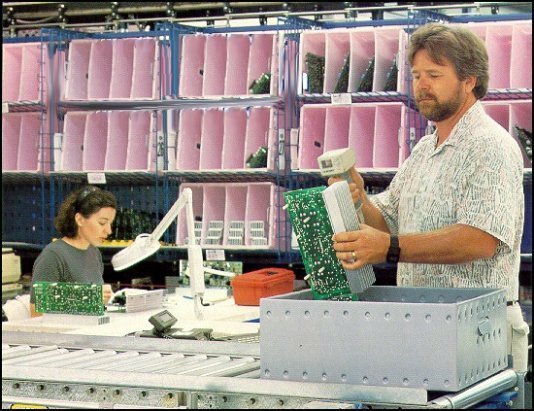 Printed circuit boards and related parts from the upper raw materials carousels travel by vertical lift down to the manufacturing floor to an assembly area immediately under the mezzanine. After wave soldering, completed boards are moved by cart to the subassembly carousel. 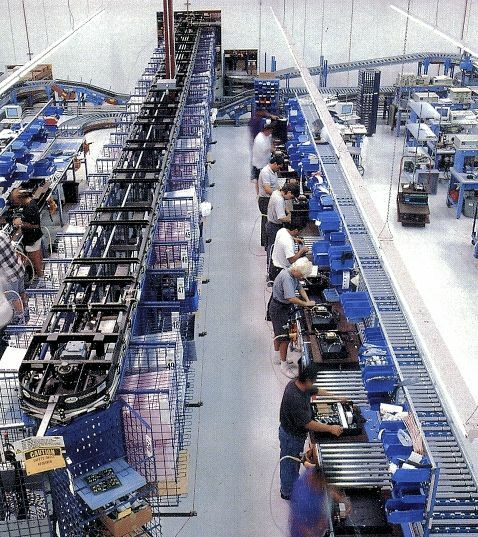 Following a progressive assembly scheme, parts move by carousel between workstations in the mechanical subassembly area. A bar coded work order travels with each core subassembly, identifying each unit and indicating assembly steps. The system is sufficiently flexible that lot sizes of one are not disruptive, says Meigs. Furthermore, most workstations can be assigned to a variety of assembly operations. After completion, each subassembly is first placed in a tote. The bar coded work order is scanned and an identifying RFID tag embedded in the tote is read automatically, linking the two together. Based on information from the MRP system, the local control system then routes each tote to the appropriate destination. Half of the subassemblies go directly to final assembly while others go to a test line. A multi-tiered conveyor system feeds parts through those stations. All parts required for final assembly are delivered directly to workstations by another horizontal carousel. This continuously rotating, 65-ft long unit is organized into zones stocked with different parts. Workers pick what they need for assembly as those parts pass their workstation. Zones are repeated so workers do not wait long for required parts to pass by again. Workers build-up the final assemblies on small captive pallets that travel easily on roller conveyor between workstations. The pallets also contain RFID tags that are used for controlling and routing final assemblies. Finished assemblies are lowered to a second tier of the conveyor for delivery to the central testing area. When amplifiers are fully inspected and passed, they are put on a third level of the stacked conveyor for delivery to packaging. Each amplifier is lifted by vacuum-assisted work positioner off the pallet (which is then recirculated for reuse) and loaded into a shipping box. A conveyor delivers the carton to a manual palletizing station for immediate shipment or temporary storage. This system has allowed us to eliminate quite a bit of waste in how we handle materials. And that's going to be a major benefit to us as we continue to grow.